One small complaint he has about me (I’m not going to list all of them or invite him to participate LOL,) has to do with the subject of handiness. My father was very handy, he could fix anything. 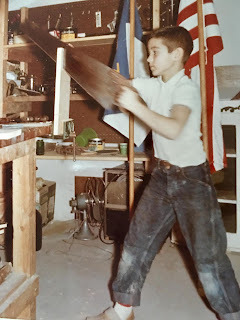 And he had a wonderful workshop in the basement wherever we lived, with a vise attached to his workbench and all the tools neatly lined up on the wall. My brother learned at his knee and consequently he is even more skilled around his own house. He does things like take apart their kitchen, and build porches, and put up new walls in the living room, and so on. In our home, we are not so gifted. I can see problems and make general suggestions. Like recently, we wanted to fill in a half moon window in our bedroom that is lovely architecturally, but a disaster when morning comes. Before 6 AM, the light streams in, and the pets get restless and our sleeping is finished..
“Look," I say, "do you suppose we could use that giant Amazon box that the pillows came in to make a temporary, stopgap window treatment?" John grumbles, but agrees to help me. We measure the height of the widest part of the arc, and the width of the arc and we draw this out on the cardboard. Then we cut it out with scissors and stick it in the window. Our ladder is too short, so it’s a little tricky for John to stand up there and poke the cardboard into the hole. And sadly, we haven’t measured accurately enough, so the light still streams in on the sides. John cuts out more pieces and duct tapes them to the original cardboard. And that is why we refer to him as the Rube Goldberg of home repair. And that is about the extent of our handiness. Here's another example: we have been arguing over who gets the custody of our one remote to enter the garage without having to get out of the car, open the door, get back in the car and roll into the garage. Finally we called a garage door repairman who came out and fixed up both cars instantly. Then he looked at our ceiling, where the doo-hickey motor attaches to the garage door rails. "Is there some reason why you don’t have lightbulbs in your overhead lights?" he asks gently. "Would you like me to install them?" I scratch my head. We've lived in this house almost twenty years and we never knew we had lights. So the man screws lightbulbs in and now we don’t have to get out of the car in the dark. And after I report all this to him, John says, "I hope you’re not going to comment on how your father and your brother would have done that twenty years ago." No, I'm not. I've been married 26 years and learned a few things. But this is our workshop, I kid you not. Duct tape, front and center. Are you handy? Do you think it's an innate quality or something you can be taught? Note from last week: Jana, you've won the Christine Carbo giveaway. Please send your email to ingrid at ingridthoft dot com so she can arrange delivery! Congratulations on those twenty-six years, Lucy . . . may you have many more. Handy, I am not. But John is a whiz. 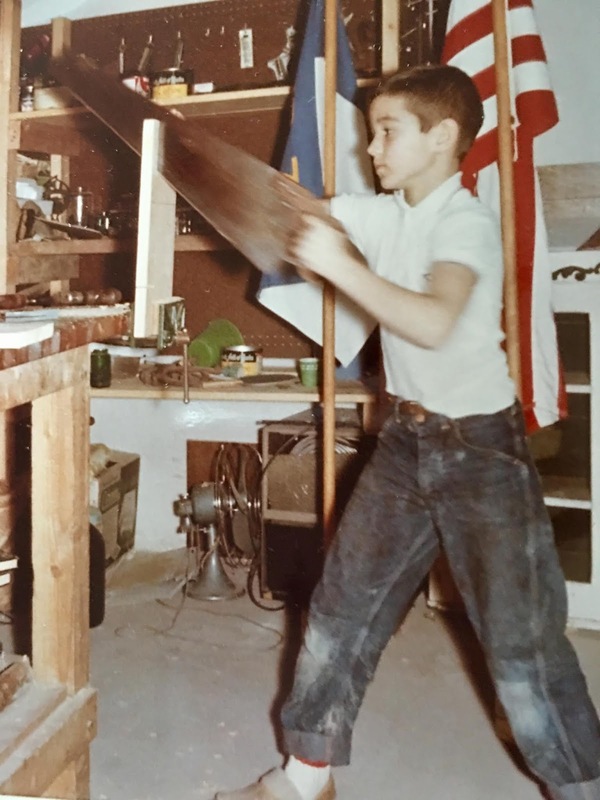 When I was teaching, he whipped up all kinds of things for my classroom so that the kids could do all sorts of neat experiments, like learning about using tools in space. He does whatever needs to be done around here; I just look on and marvel . . . .
that's wonderful Joan, he's a keeper in so many ways! Congratulations on the wedding anniversary! You were a lovely bride. Your MIL had no reason to worry. As for handiness, my grandfather could fix or build anything. When he was younger, my father could, too. But, while Grandpa Jack saw home repairs as an interesting puzzle to solve, Dad saw them as a pain in the patootie. He went off to get advanced degrees in building things and spent the rest of his life watching other people do the actual work. I grew up following my grandpa around, watching him work his careful, patient magic. Nowadays I know that stuff can be fixed, and I enjoy fixing it if I can. I have changed out the heating element in a dryer, swapped out an ugly overhead lighting fixture for a nicer-looking one, and replaced the whole guts of a toilet. I roam the aisles of Home Depot and Lowe's, and have amassed an interesting set of tools that extend far beyond the pink hammer and screwdriver some lucky little girls get for Christmas. There are days, however, when I look at the job at hand and say, "Nope. Not in the mood," and opt to stimulate the local economy instead. Thank goodness there are still guys around who know how to fix things and will answer the phone when I call and offer money. Oh you are a star, Gigi! Do you think then that you learned how to fix things rather than being born with the juice? I think I was born with a mind that was intrigued by the puzzle, then I learned how to solve it. I did have to dig through several layers of crap about "man mysteries" (as in "women can't understand this stuff, little lady") before I figured out that some guys make it all seem complicated and mysterious so women will be impressed by their skills and never discover that it's dead easy and they've invented a lot to shortcuts to make it even easier. Liberation apparently comes in many forms, on many fronts. What a funny story! I am pretty handy. Over the years I've rewired lamps, built a cedar chest, hung bookshelves, and even created a concrete pad at the bottom of our new deck stairs in a previous life so we didn't have to step onto wet grass on the way to the driveway (my husband at the time was too cheap to hire someone and was completely unhandy himself, so when he went on a two week trip, I figured out how to do it myself). I also used to do a lot of my own car repair when I was younger. But now I live with someone supremely handy like your brother, Roberta, who even works as handyman for other people. He would be that garage guy, coming home scratching his head about the things people don't know how to do. So I don't do as much of the handy stuff any more, because he can do it so much better! Oh, and many congratulations on a long and solid marriage! If you ever need him to do something while you are away, he could just stay there. He's a brilliant interior painter. I can change lightbulbs but I'm pretty pathetic otherwise. I can't do construction projects or fix household issues that require specific knowledge to complete. I'm sure this is some sort of character flaw but it is what it is. sometimes it's good to know our limits though, right? Oh believe me, I don't pretend to to know more than I do. Something goes wrong, I just hear the wails of agony emanating from my checkbook. We all have our areas of expertise, don't we? Everyone is a genius about something (although some people are just extremely good at irritating others). Cooking, golf, and writing are your areas of expertise, Roberta! I can't do two of those. My husband and I are both handy in different ways, luckily. I can sew anything you can think of, and have painted practically every square inch of our nine-room house over the years. Steve built a shed in the backyard 32 years ago, and made patios front and back, with stone walls. But he has never hammered a nail inside this house. Steve used to fix appliances, etc. But he almost always had parts left over, which I still find hilarious. None of our parents were handy, except both our mothers did different crafts (sewing for his, needlework for mine) when they were younger. But if any projects had to be done by our dads, they both had to hire the work out. I am in awe of Edith. You would be a great pioneer woman! You may be onto something, Karen, because I am good with my hands in lots of ways--painting, sewing, as well as simple repairs. So maybe there's some kind of genetic predisposition to doing stuff with our hands. One of my grandfathers was a foundry worker, and he was amazing with all sorts of handcrafts. The other was a fantastically talented wood carver. He made many, many chains of wood, connected to little cages with perfectly round balls inside. They fascinated me as a child. Both men were also very good gardeners, and the carving grandpa also made all the family cakes, from scratch. Some things might skip generations, because my father-in-law's father was a landscape gardener, but I don't think my FIL ever dug a hole in his life. Yes Gigi, but I think it must make a difference what you're exposed to as a kid. In our family, girls simply didn't go into the workshop--or take shop in school, for that matter! Oh, yes, I remember the days when girls weren't allowed to take shop class because "their hair might get caught in the machinery," as if hair nets and rubber bands had never been invented. My mom wanted a mantel over her fake fireplace. My dad tried to build one but...it didn't go well. He left in a snit for a local tavern to get a beer or two. While he was gone, I quick took apart what he'd done and repaired it, since I had mad stagecraft skills. When he got back he looked at the mantel and said, "I guess it doesn't look as bad as I thought." We never told him that I did the work while he was wetting his whistle. Love it Delaney, how old were you? ah, what did we do before duct tape?! We're not handy, though Jerry can and a picture and manage most electrical repairs. He hates heights so ladders are a problem, which limits us. I'm getting better at calling a handy-person, especially since the Internet has made this so much easier than it used to be. You know what they say: If it's supposed to move, but doesn't, use WD-40. If it moves, but isn't supposed to, get out the duct tape. Lucy, I think being handy must be in the genes and cannot necessarily be taught. My father was the handiest man I knew and his mother was also handy - could do anything with her hands. I sorta know what to do even if I can't always do it. Last week I had a problem with my washing machine and I needed to take it apart. I could see that a tool was required that I did not have. Called my 14 year old granddaughter and asked if she could bring her socket tool over. She wondered what size but I didn't know so she said she'd bring the big set then she'd be sure to have to right one. It took her less than 5 minutes to get the thing apart and back together! Before I had called her I ordered a socket set so I would have one of my own. After she fixed it for me I said I guess I'll cancel the set I ordered. Why, she said, it won't hurt to have it,so I let the order stand. Thank goodness for my handy granddaughter! It's probably not all that impressive that I wanted to take the machine apart. My washer is the kind that doesn't have an agitator but there is a rather large disk plastic thing. Somehow a curtain had got caught underneath that thing and I couldn't get it out. I looked at youtube videos but couldn't find that problem. (I did later, though; some had a tablecloth get caught like that!) But the video gave me the confidence to use a screwdriver pry off the sliver colored cap thing in the center. That's where I found a nut that I couldn't turn. A socket tool was needed. BTW, the curtain was absolutely ruined. Myself, I'm not that handy. But I don't have to be. The Hubby has taught himself most things over the years. He can replace the boards in the porch/deck, install outlets, new lights, do drywall, and wood work (he used to be nervous about mistakes, then a friend of his said it's not about not making mistakes, it's how well you cover them). agreed, that skill is crucial! One thing that makes it a little easier these days is YouTube videos. Yes! The Hubby fixed one of my car doors recently after watching a YouTube video. Lucy, you need to order a "sunburst" which is a gathered fabric half circle that completely covers the glass. Some prefer a voile, which lets in filtered light, and some prefer a heavy fabric which lets in zero light. the blinds guy came on Saturday! We all have our different methods, right? When I found a window in the basement that was broken, I taped a couple of pieces of cardboard over it with duct tape, of course. It looked terrible. And of course, was a worthless repair. But so scary… when Jonathan got home and I told him about the problem, he started getting out saws and plywood. Completely makes my stomach hurt when he starts to use a saw, so I refused to let him do it. Same with electrical things. He loves to fix electrical things, and it terrifies me. But he’s pretty good at little around the house things. I have a system, though. If I ignore it, it will go away. Honestly Hank, I think we all need Edith's beau on speed-dial. Hank can easily get him to go to Newton! Congratulations on your wedding anniversary, Lucy! May your next 26 years treat you as well! 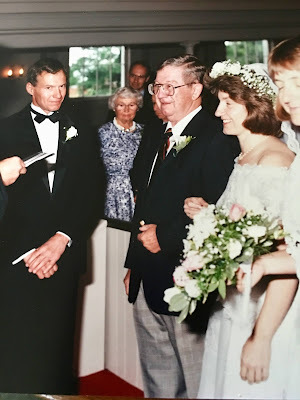 At any rate, he and I had that serious conversation more than 30 years ago, and it has been a handy touchstone throughout our marriage. Occasionally it can be frustrating that we can't accomplish fairly simple tasks around our house, but then we say, "Hey, we're just doing our part to keep the economy going. Handymen need work, too!" You get smarter on a second try! I honestly think that's one of the reasons a lot more second marriages succeed -- by the second time around, you know where the landmines are! Lucy, congratulations on 26 years and a true partnership--sometimes it does take two people and duct tape to get a job done well! My Grandpa Thompson could do everything from fix cars to build houses--my mom was never taught (being a girl, in those days, you know? ), but could do simple repairs, all the painting, etc. My dad was not handy--but he had an assortment of brothers-in-law and a younger brother who were. I'm pretty good at minor repairs, can do whatever painting I want, put things together, but know when to call in the pros. However, when I moved into this house, 13 years ago, the light over the sink did not work. My next brother down (brothers can do electrical, plumbing, etc.) fixed it, but then it stopped working again shortly thereafter. Last year, when youngest brother was visiting from Florida, he took care of some small things for me and I mentioned the light fixture. Turns out the bulb needed replacing--I will hear about this at family gatherings for the rest of my life, naturally. I am specifically handy. For thirty years I had a Kirby vacuum, and there was nothing in or on it that didn't get replaced or repaired. Finally the cast aluminum housing cracked and that was it, no parts available. Still the best vacuum ever. Now I do small things and only if I have the manual. Like replace refrigerator/furnace/dehumidifier filters, troubleshoot problems with our flipping NEW appliances, all of which have now gone on the fritz, nothing big and all repairable by me. What I don't do any longer is get on ladders, step stools, of climb on furniture. Although just this morning I crawled behind the couch to check the power connection for our internet modem. Yes, the dam cat had flipped the switch. I'm pretty good at solving computer problems, too. Even if it involves taking off that sticky key -- it's the O one. And leaving it off when I broke it. Oh well, time for a new computer next year anyway. Who needs an O anyway? I'm also the only human in this household that can mend a seam, sew on a button or replace toilet paper on the roll, not to mention any names. Julie sees any problem she can throw money at as a non-problem. We have David, the local handyman, always working somewhere in the neighborhood, and he takes care of things that require a ladder or a power tool. We have Mr. Guck who sees to the lawn, mows for 25 bucks an will take down a tree for 40. No kidding. For all else I, like Gigi, depend on WD-40 and duct tape. Can't go wrong. Our family joke was that my father couldn't change a light bulb. A bit of an exaggeration, but not much! He grew up on a farm and when asked if he'd learned to milk cows, his answer was, "No, because then I'd have had to milk them." However, he liked to garden and was great at household chores. I'm definitely a chip off the old block, lol. Not the least bit handy, but I can garden and cook. Both my mom and my grandmother tried to teach me how to sew--I was hopeless. My hubby, however, can fix just about anything. Plumbing, wiring, appliance repair, car repair, and he actually LIKES doing it, which seems incomprehensible to me. I suppose that makes us a pretty good pair. And Happy Anniversary, Roberta and John! We hit 24 years in May, so we're right behind you! thanks Debs, and congrats back at you! LOL - Happy Anniversary! I was born into the handiest family in existence. My current summer project is to refinish all of my kitchen cupboards — all by myself. My brother just did his, my mom who is seventy-five just did hers, and when my dad was alive he remodeled his whole house. We all really enjoy these sorts of projects and get great satisfaction out of them. Hub is not even sure which end of a hammer you’re supposed to use and his whole family is equally befuddled like that. The Hooligans are painting their bedrooms this summer and I’ve already taught them to rip out carpet and linoleum, put in new flooring, build a screened porch, change all the locks on the doors, switch out light fixtures, and lay a concrete patio, so the handy gene will carry on! I used to think non-handy people were just lazy but I really think you just have to enjoy this sort of thing. Thankfully, I do! WE marvel at you Jenn!! Holy crap Jenn! Come to my house and bring the hooligans with you. Happy Anniversary Roberta and John. Roberta you are hysterical! Ang is very handy, his Dad was a carpenter and he learned a lot from him. My FIL would tell Ang how to do things and he would. There are some things that we hire out, like electrical and plumbing.Mike, our son is very, very handy.maybe it is in the genes. Dr. Science says duct tape is the primordial ooze of God. And he has, you know, "a master's degree -- in science!" My husband is quite handy -- in truth, he can do pretty much anything -- but doesn't necessarily WANT to, you know? Other things to do. So we hired out the bathroom remodel and are currently sleeping and showering in the cabin. And every tradesman who's come to the house comments on the spongy front porch! that's a good point--just because you could do something doesn't mean you have to! Congratulations on the anniversary! I wish you 26 more, at least. In our house, my husband is the handy one, and very much so. He enjoys working with his hands because does none of that in his career, and when he does a job, it will be done well. It will also require 261 trips to Lowe's, but as long as I don't have to accompany him, that's okay. I can hang a picture and do a few other minor jobs, but mostly I just say "Don't fall off the ladder" (because he did that once and broke his leg) and only participate when it's requested. He won't do anything electrical, thank goodness. I think you have to know your limits, and not getting electrocuted out of pride is his limit. Congratulations on the 26 years, Lucy & John, and on the 24 years Deb. I am handy out of necessity. When our repair person said it would be $50.00 to replace each electrical switch, or receptacle, I said "off to Home Depot + You Tube Study". I can do repairs, would rather be reading, tho necessity means sometimes I am reading how to books and repair manuals. So smart Coralee, so it can be learned! And PS, I should have said right at the beginning: Wasn't John a good sport for agreeing to be in this blog? He was up on the ladder with the duct tape when I cried: Wait, wait, I need to get a picture. This is going to make a great post! Happy Anniversary, Lucy! I lucked out in the handy department: My hubby is very handy having been taught by his dad to fix all kinds of things. I was taught the basics, so together we make a good team. The one thing I loathe to do is measure. I swear the numbers change every time! And ladders should be avoided at all costs! I know too many people who have had serious injuries from a ladder fall. Can I just speak up for John! We all love Roberta (aka Lucy) but I think she is not extolling his virtues adequately because he: drives a golf ball to great distances; encourages tennis balls over the net without breaking a sweat; and guides two skinny slats down mountainsides with surprising grace. And, he can even make waters part as he passes through with a smooth free style stroke. I'd say that has mastered the physical world superbly. So what that he can use a screw driver. That's what handy men are for. Good point LOL--he has the life skills that matter! I am not handy in the slightest. My dad tried to teach me some, but it went in one ear and out the other. I have very few tools. And my condo shows the results, too. I'm from a non-handy family, although some do try (and shouldn't have!) At the beginning of April I had minor knee surgery. One of my sisters stayed with me for a few days to help out. She mentioned my sluggish bathroom faucet, and asked if I had tried to fix it. (Yes, but none of the methods I used worked.) Another sister dropped by one day, and the two of them told me that "we can fix this for you." Since I was going to retire in May, my plan was to wait until late May or early June to call my plumber. They insisted that they could fix it, and one of them went on line for some suggestions in how to accomplish it. I thanked them for wanting to try, but it's a known fact that the plumbing in my condo complex is, well, strange. Local plumbers don't look forward to doing repairs in this complex. They still insisted, and kept telling me to "save your money, Deb". They managed to unclog the sink, and water now flows freely. However, the "tool" they used, a wire coat hanger, got stuck part way down the drain. Oops. One of them was going to check at home to see if she had wire cutters. She's been back here several times, but without wire cutters. When she uses the bathroom at my place, she does what I do when she washes her hands, tries to avoid gouging out her eyes from the part of the hanger that sticks out about ten inches. I still love my sisters. One of there days I'll remember to call the plumber. Laughing. Maybe duct tape a cork or tennis ball on that wire? This is hysterical DebRo. If there was a prize today, you would be the winner!! I am not handy but thank God my husband is, not only with cars but around the house, too. He's saved us hundreds and hundreds of dollars in repairs that he did himself. And when he does hire someone to do sonething, he generally knows more than that guy, and makes sure they do everything right . We have various degrees and fields of handiness in our families. Two of my sibs paint as neatly as you would ever want. I am a bit wild with paint and my husband refuses to touch a paint brush at all. 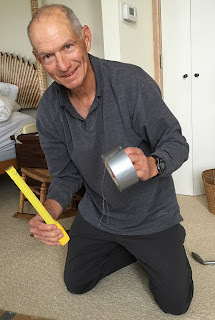 I do use duct tape and various materials sitting around as solutions to problems. Husband rails on about hillbilly repairs and hires someone to fix said problems. He is capable of some repairs but as time goes by prefers to hire someone else to do it. Although he did do all kinds of repair jobs for his parents while they lived in their house. Now why can’t he do the same things at our house? Oh! Happy anniversary Roberta and John! My, my, my! The old spam filter has gone to the beach and left us with magical marriage repair. Does anyone fall for that stuff? Funny this should be the subject today -I'm late to comment because my brother and his family are visiting, and my brother has spent all day ripping out old latticework and installing new lattice, whacking back overgrown bushes, fixing my sink, etc., etc. Last summer he came up and rebuilt my front porch. Like our Dad, he is Mr. Handy Guy. My dear Ross, on the other hand... let's just say I didn't marry him for his carpentry (or wiring, or plumbing, or painting) skills. I can accomplish some small, simple tasks, and I love problem-solving, but beyond that I rely on professionals. Dad taught my brothers to use power tools, but refused to let me touch them. Mom shared sewing wisdom, and Grandma taught crochet, just as useful in many ways, and especially needed when there were no latex-free underclothes or swimwear on the market. Speaking of latex, duct tape has latex, so I have to find other ways to fix things. ;-) (Brava for "fixing" the spam). Hey, Reds and commenters, blog was spammed/ hacked about midday on June 6. Noticed several — all from same “person”around 7 pm EDT June 6. Ugh! Note on the spammer/hacker posts. I see that the blog administrator removed one, but there are three or four at the beginning of today’s posts still there. Thanks for doing such a good job of keeping this blog free from such stuff. And to all the Reds and commenters who are blessed with 20 year plus commitments: Congratulations, keep on loving and balancing each other. I'm not very handy, but it push comes to shove, I can paint and do a decent job of it. I have thought about taking a class they sometimes offer (or used to anyway) at Home Depot or Lowe's about using tools. Come to think of it, I haven't seen those offered in a while. I'd like to learn how to use a drill and some other basic tools. I can hang up pictures with a hammer, a hammer that I keep hidden because if I don't someone else uses it and it disappears. My husband is handy for certain things. He can work on a washer or dryer if it's not too serious. He can repair a screen. He can do certain maintenance work on cars. However, he sometimes likes to think he can do things he can't or shouldn't. I've gotten him to the point I can usually convince him we need a professional, especially plumbing. He does drive me a little crazy when he goes to do something in that he makes numerous trips to Home Depot in the process of a project. I guess I'm more of a planner, in that if I'm going to do something, I like to have all the tools or whatever I'm going to need before I begin to work. Almost bedtime, but I enjoyed this post -- thanks! I grew up with handy parents who both taught me lots of skills -- and I married a man who had a single parent (his mother) who was very handy, but taught him nothing about such mundane matters. He gets tense when he has to move furniture. Forget figuring out the storm windows/ screens in our apartment -- the ones I can't maneuver are permanently stuck in place. It's an interesting question in a marriage! I have one son-in-law who is very skillful, but he is such a perfectionist that jobs take him forever!! I'm more slap-dash, but I get stuff done. By the way, go to a curtain store -- they make window coverings for shapes like that.